Surprisingly, Dr. Horton’s path to chiropractic started out with dentistry. I planned on being a dentist, until my best friend in high school asked me, ‘’Do you really want to spend the rest of your life putting your hands in people’s mouths?” That made me re-think things! Thirty years ago, I’d never even heard of a chiropractor, much less been to one. Then one day, a chiropractor came to my school for a career day lecture and that changed everything for me! When the speaker explained the principles of chiropractic, it was like a little light went off inside my head. I thought, ‘’Wow, that sounds right!” Fixing the body from within and really treating the source of a person’s problems made me realize that chiropractic would be my career choice. 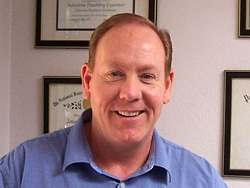 Dr. Horton attended Palmer College of Chiropractic West in San Jose, CA, where he played rugby. When I’m not at work, I’m an avid bicyclist. My two boys are also involved in sports—basketball, football, lacrosse–you name it! On the weekends, I love family time boating up at Lake Sonoma. In his community, Dr. Horton is an active Rotary Club member, as well as past president in the Active 20-30 organization.